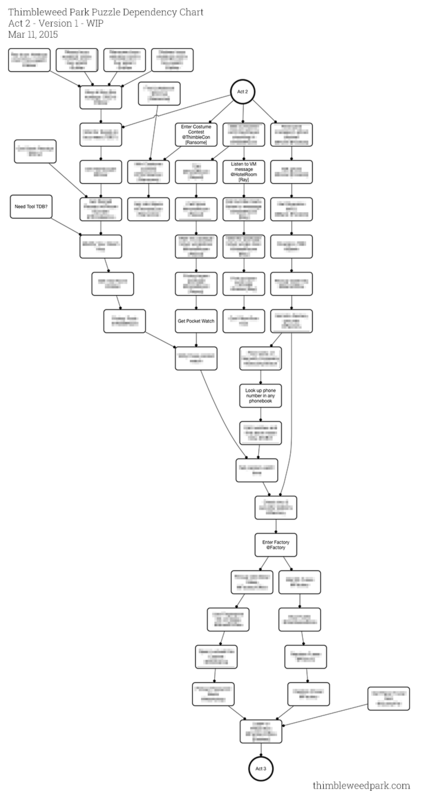 Time for some more puzzle dependency charts. Forget Instagram and Snapchat, it's time to start sharing your puzzle dependency chart with all your friends. It's the thing all the kids are talking about. Here is a first pass at the puzzles for act 2. There are still some puzzles we haven't figured out, so this will get a little beefier in the next few weeks, but all the core chains are there. There are a couple of puzzles that start in act 1 and don't get finished until act 2, so that's why there are some unconnected nodes. There are a few more puzzle chains that happen in the factory, so the bubble at the end will get more complex, and still contain a similar feel of parallelism. This also doesn't include the character specific puzzle chains that only relate to the character stories, since many of those are optional unless you're solving the epilogues. I'm keeping the puzzle charts for the three acts separate right now, just so they are easier to edit and manage. Once act 3 is designed and charted, I'll move everything into one big chart. It's going to make my head hurt when that happens. A couple of things came out of this latest brainstorm session. The first was the length of the three acts. Should act 2 be the longest/biggest, or should that be act 1? It feels like act 2 should be longer than act 1, just for pacing reasons. Right now it feels like act 1 is bigger. That might be misleading due to the character focused puzzle chains not being part of the chart, and they will add playtime during act 2, although it is "optional". Act 3 should be the shortest. Players will know what they need to do by the end of act 2, so act 3 should be a nice fast paced conclusion, and you don't want it to drag on. Being back on Mêlée Island with LeChuck was the act 3 of Monkey Island. It's hard to tell the true length just based on puzzle charts, but it's a good indication. We won't know for sure until we start playing it, then we can adjust as needed. Add a puzzle here and there, or snip a few away. The second thing was realizing that this story is really about the two detectives, Ray and Reyes. They are the main characters. Ransome, Delores and Franklin, although fully playable, are really supporting characters. They have great b-stories, but the game is about the detectives. There are lots of puzzles where you need to be one of the other three characters, but you will probably spend most of the time playing Ray or Reyes. They both have very different motivations and personalities and one isn't more important or more of a lead than the other. This is a good thing, it feels like it's giving the theme of the story more focus, but still giving players choice and alternate avenues of exportation. It's looking great! Thanks for keeping us updated. It's really interesting following the game dev process for this specific game. Yes, Act 2 should be longer, me thinks. I also think that Act 2 should be the longest. Act 1 should allow for getting into the game and all the characters quickly. Act 2 should really be the meat of the game. Puzzling, getting stuck and all that stuff. I believe act 1 should be an introduction, act 2 the core of the game, and act 3 a wrap up. By the way, thanks so much for taking time to make this dev blog EPIC. Hello Ron, I missed my chance for a dev blog suggestion in the last post... I would personally love to learn/hear/see an update about the music side of things once it happens. Studio photos, demo tapes, and rock and roll stories would be welcome. Will do! Once we start the music, we'll be doing a lot of updates. Second act being the longest makes the most sense. Monkey 2 always seemed to be the ideal to me, where you had a small hub of puzzles on Scabb to get you acclimated, then you had the absolutely massive section that consisted of finding the four map pieces. Monkey 1 only fits the mold if you consider the end of the Trials as the end of Act 1, and the ship/crew finding, sea travel, and everything on Monkey Island to all constitute Act 2. Monkey 1 was divided into "parts", but I always considered the end of act 1 to be when Elaine was kidnapped (or supposedly kidnapped... SPOILERS). To be honest, although I *really* loved Monkey Island since the first time I played it, I expected to some degree the adventure equivalent of the "harder final level with mighty boss fight", and the last Act to be longer. Every time I replay it, once I reach the last Act I feel unmotivated 'cause it's so easy and short. Finding so linear and easy always leave me a sense of "void". I agree. I was expecting as much gameplay in Act III as in Act II and was a little disappointed by how quickly it ended. It's a very good idea to use Monkey Island as a role model for separating the different acts. I absolutely agree that the second act should be the longest and the final act should be the shortest (but maybe the most spectacular one). I think if the game begins with some mysteries you shouldn't keep the player in the dark about the causes for a long period, because every storyline needs a thrilling framework from the very first (like rescuing Sandy in Maniac Mansion). I think have some mild PTSD when it comes to adventure games and really hard NES games. I feel a sense of panic and anger just looking at screenshots sometimes. Even the music can be a trigger. I hope I get pissed and uninstall Thimbleweed Park at least once during the second act, but if I don't, that's OK, too. I know they're designed differently these days. People talk about Dark Souls being hard, and I just don't get it. Get off my lawn! You didn't have to play MI2 without a walkthrough! (I spent 3 months on Scabb Island). Dark Souls is no harder than Zelda '86. Just lots of pattern recognition, trial and error, and patience. I think you give just the right amount of detail. Keep on doing what you're doing; keep the code snippets coming! If I can add my two cents, I when I played Monkey Island 2 back in the day I found the third act extremely disappointing due to it being so linear and short. Note I have not gone back and replayed it since (though now I am feeling like I should!). But I do remember spending weeks getting through the first two Acts and then just blowing through Act III in a matter of minutes. Upon reflection, I do think this is a bit of an audience expection or 'theatre of the mind' thing. That is, I don't think it is entirely rational. Monkey Island 2 overall satisfied in length. But the size of Acts I and II just led me to feel like Act III was going to be bigger than it was. So when the game didn't meet that expectation, I felt cheated. I think the idea of act size being Act II > Act I > Act III sounds right. Act III should feel very singular in purpose. But this doesn't mean there can't be a few multi-step puzzles across a mix of new and old locations all running in parrallel for the player to achive that purpose. IMHO if Act III is too much smaller than Acts I & II you should expect a decent percentage of players finishing the game feeling irritated. Rational or not that reaction might be. I have to agree. Both Monkey Islandses seemed to toss everything out in the end to make a beeline for the conclusion. I found the endings almost felt disconnected from the rest of the game in a way. One of my favorite story techniques is, at the end of Act 2, you make like you're moving into the quick conclusion and then throw in a Clever Plot Twist(tm) and reveal an Act 3 that is similar in length to Act 1. IME there is no greater joy than believing you're coming to the end of a great game only to realize that you still have much more ahead (I'm looking at you FF6). Yeah! i support that! just like sleeping a little more once the clock has rung. When I played MI 1 and 2 for the fist time as a kid in the early 90s I wished the game would never come to an end because I loved it and it made a lot of fun. So I was deflated, too, when it was finally finished. When I played it again I already knew the storyline so I was prepared for the endings. The short length was no skin off my nose any more. I think if you divide the plot in three acts it is clear that act 3 is essentially the finale. In my opinion the length of a conclusion is less important than the elaboration. It must not seem crude or disconnected, but it should be a satisfying reward for the player's achievements and quicken the appetite for a possible sequel. Ideally peppered with some humor. But act 2 is not less important than act 3 inasmuch as act 2 is the corpus. I agree. As a player, I have a certain expectation regarding how much of the game is left. If I expect to have at least an hour of solid entertainment still before me, and it turns out to be just a few minutes, I feel cheated. I don't think I felt that way about Monkey Island. From what I remember, Act 3 had a definite "showdown" feel to it, so I didn't expect it to last long. But I remember being really disappointed about the end of the original Broken Sword game. I spent an eternity puzzling my way into the catacombs of the Templars. A few quick time events later, the credits were rolling, and I though "wait -- that was it?" You are right. It's important to prepare the player well-timed for the end of the game. Elsewise he feels snubbed or something. "Act 3 had a definite "showdown" feel to it, so I didn't expect it to last long". I totally agree. Length is not a problem if the player can feel he's reaching the end. I remember playing MI2 and I KNEW the end was near, and grew impatient as I tried to solve what I thought would have been the last few puzzles. That was a great feeling. I loved the ending of Monkey Island 1 because it was extremely climactic. Granted, LeChuck's Revenge also had a climactic final battle, but the ending was totally Gainaxed. It's far too late to go back now (what with MI 3-5 being canon and all), but I just wish Ron didn't leave with unanswered questions, not unlike waking up from an interrupted dream. I agree that Act III was too short (see my above post). And, you should definitely go out and get Monkey Island 2 Special Edition! You can play it on an iPad, iPhone, PlayStation 3, or on Xbox Live Arcade. Well I still own the CD versions of the first three Monkey Island games! Not the boxes though sadly. I just need to figure out how to get them working on ScummVM I guess. Seems like it won't be too hard. Hmmm, maybe I could even get my Mac Book to airplay it on my home theatre! The Special Edition has updated graphics and sound, and includes concept art and designers' commentary. Two detectives makes me think of Sam and Max... It's very exciting to read about the development of Thimbleweed Park! :-) I wish the genius Shigeru Miyamato could share this way. But I also see two "dead ends" in the chart; and idea what willl become of those? It makes sense that the 2nd act is the longest one, as I assume that's where most of the detectiving and other adventuring takes place with 1st act being more of an introduction to the world and the characters and the 3rd being the resolution to the story + the character epilogues being the bow tie on the top. No boss fight at the end of the game like in MI2, please. It was really annoying to solve the puzzles with that preasure. The script was not very well timed in the Monkey 2 showdown. The time it gives you to react is completely dependent on the subtitles. Slow them down, and you have more time to click around. In the Ultimate Talkie Edition patch, I changed that script so that you have always at least 4 seconds for clicking around before LeChuck takes over again. I hope that this game is going to be as good as Monkey Island ( my favourite game! ) ... Good luck Ron and Gary!! As a player, I liked the act breaks in Monkey Island. It gave you a sense of achievement and progress, and a vague idea of how long it might still be going. Being back on Mêlée Island with LeChuck was the act 4 of Monkey Island, wasn't it? Act 1 Mêlée island, Act 2 ship, Act 3 Monkey Island. Hi Ron, it looks really interesting. Can you explain the logic behind the puzzle column under the act2 circle? It seems like it does not connect to rest of the chart, or maybe i misunderstood? It will get connected during Act 3. I wouldn't be concerned with act size. The only reason you would want the first act to be smaller is to introduce the player to the interface and style of the game in a contained setting, as to not overwhelm. However, if act 1 is already sizing larger than the second, I wouldn't deviate from that plan. I wouldn't compromise your plan for the game just to create boundaries to accommodation perceived act size. Ron, would the same type of charts work when writing interactive fiction with Inform? I've noticed in your puzzle dependency charts that it seems like you'll occasionally have redundant dependencies, where a node will connect both directly and indirectly to another node. For example, in the chart used in this post, the node that starts the puzzle chain that includes "Look up phone number in any phone book" connects to the node above "Enter Factory" both directly and indirectly through the puzzle chain. It seems like the direct connection isn't necessary, since that node would need to be completed anyway in order to begin the chain. I'm not trying to be pedantic here, but I'm wondering if there's some significance or meaning in that relationship that I'm missing here. Anyway, I just recently stumbled upon this blog, and it's been a thrill reading through the archives and getting caught up. I look forward to following along with your progress. Best of luck! Yes, that is an error. I probably had it connect at some point, then after filling in all the other puzzles forgot to remove it. I sometimes do leave the redundant dependancies for clarity, but that is rare. Oh, now that I look at the closer, I'm wrong. The dependency exists because the object is used twice, once in the first connection, then later on. Oh, that was quick! Thanks for the speedy response! That makes sense then. So it's not just a flowchart of the game's logic (and I know you've said repeatedly it's not a flowchart), but also a modeling of the physical interactions (dare I say it, dependencies) among objects. That makes it a little clearer then. If we could show the full chart without the blurring, it would be clear, but I fear several readers would have our heads for spoilers. One of my favorite games from the time was Zak McKracken and the Alien Mindbenders (minus the mazes). I received this game for Christmas for my commodore 128 after beating Maniac Mansion. One of the things i liked about the game is that you could solve smaller puzzles in multiple ways. I don't think any other adventure game let you do this (granted i havent played all). Any plans for this sort of versatility in thimbeweedpark?